At Jou Nouvo, we are focused on advocating for equal access to a good education for the families we serve through our child sponsorship and adult literacy programs in Bon-Repos, Haiti. We believe that education at any level, is an important step out of poverty for every child and adult. We serve the Bon-Repos community in Haiti. Bon-Repos is about 12 kilometers (7.5 miles) from to Port-au- Prince, the capital of Haiti. Until the late 1970s, Bon-Repos was known for its vast open space and its rich soil which was ideal for agricultural production. Today, Bon-Repos is referred to as a poor suburb that is overpopulated with minimal land left for farming. In Bon-Repos, private schools, churches, shops, and open markets are in abundance. However, access to health clinics, libraries, and free public schools is very limited. In this area, crime and unemployment are high and nutrition and health conditions are declining. 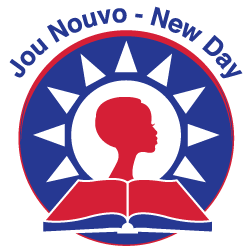 Jou Nouvo was created to address the needs and aspirations of the Bon-Repos community. The spirit of Haitian culture is an important part of Jou Nouvo’s mission. As Kerline Tofuri, Jou Nouvo Founder and Board President explains, "growing up in Bon-Repos in a family of farmers, Haitian culture has its roots in our belief of 'Konbit', which means working together as a team, a tribe, to complete a task through until the end. There is joy, singing and dancing. There is learning and laughter. There is a picture of people coming together to exchange ideas, encouragement and empowerment to realize concrete or transformative change for the welfare of everyone, for self, for community and for Haiti as a country." Retaining the spirit of the Haitian culture is for each participant of Jou Nouvo to find it deep within themselves the ability to be or become independent, whether it be via education and work. Despite their struggles, they are strong and they are together. As a group, we are a family. Everyone at Jou Nouvo is able to express their views in any language that they feel comfortable. We all strive to respect our environment and to treat each other with honesty and kindness. Above all, at Jou Nouvo we serve everyone with dignity, regardless of their religious beliefs or economic situation. We are also grateful for the tireless commitment of our team of regular volunteers, who donate hundreds of hours of their expertise in areas including grant writing; coordination of fundraising events; program administration and development; donation and collection of school & medical supplies, website development; database development. In early 2008, Haitian native Kerline Tofuri founded Jou Nouvo to respond to the needs and aspirations of the poor in Bon-Repos, Haiti, her community of origin. Soon thereafter, Jou Nouvo, a 501(c)3 organization, began its first programs: Adult Literacy, Basic Health Instruction, Small Business Loans and Child Sponsorships. Through local initiatives, Jou Nuovo aids in building a more sustainable future in Haiti by drawing upon the power and spirit of the Haitian people so they may one day, live a life free of anguish. The success of the program is due to resilient and authentic spirit of the Bon-Repos community and the generosity of Jou Nouvo's donors and sponsors. In 2009, Partners In Development (PID) formed a partnership with Jou Nouvo to unite and respond to the needs of the poor in Bon-Repos, Haiti. Now PID and Jou Nouvo are actively working within the Bon-Repos community to provide access to medical care, loans for small businesses, literacy programs for adults, and sponsorship programs for children so they may have the opportunity to attend school in the Bon-Repos area. Jou Nouvo brings together supporters from the United States and experienced community leaders from Haiti to exchange ideas and work together in order to provide a venue and staff to teach fundamental literacy skills to adults. The program is accessible to those who, for the first time, want to learn to read and write in Creole, as well as those who wish to continue to improve their literacy skills. Additionally, the program provides basic instruction to strengthen family health as well as guidance in economic development and stability supplemented with a small loan.